The First Poster for Roman Polanski's Black Comedy 'CARNAGE'! A first poster has been released in France for Roman Polanski’s Carnage. The film, based on Yasmina Reza‘s award winning play 'God of Carnage' follows two sets of parents who meet after their children are involved in a fight, only for things to quickly become heated. The parents are played by Jodie Foster, John C. Reilly, Kate Winslet & Christoph Waltz. 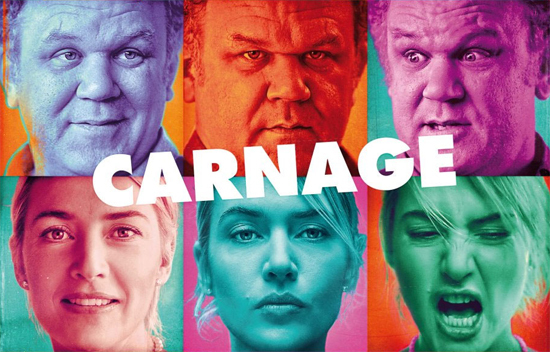 Carnage opens the New York Film Festival this September 30th, and arrives in theaters this November 18th. Hit the jump to check it out. Synopsis: "A showdown between two kids: about eleven, in a local playground. Swollen lips, broken teeth… Now the parents of the “victim” have invited the parents of the “bully” to their apartment to sort if out. Cordial banter gradually develops a razor-sharp edge as all four parents reveal their laughable contradictions and grotesque prejudices. None of them will escape the ensuing carnage." I'm reading: The First Poster for Roman Polanski's Black Comedy 'CARNAGE'!Tweet this!